(Carcanet Classics, 2018); pbk £14.99. Arthur Rimbaud, eminent French poet of the late 19th Century, precocious in his genius and revolutionary in his poetic considerations, was a defining figure of Symbolist and early Surrealist movements. This volume is a reissue of the masterful translation by John Ashbery, considered one of the greatest American poets of the 20th Century, having received multiple major American awards for his works, such as Self-portrait in a Convex Mirror, a collection that received a Pulitzer Prize. His sense of the French language is evident as the reader delves into the collection and explores this translation of Rimbaud. Any fine street of Paris has the advantage of air that is like light […] where savage gentlefolk hunt down their gossip columns by artificial light. Ashbery writes that ‘absolute modernity was for him [Rimbaud] the acknowledging of the simultaneity of all of life, the condition that nourishes poetry at every second’. This absolute modernity is perhaps granted by this translation, published nearly a century after the original work, infusing the poems with a newfound modernity, while maintaining slight archaisms associated with the French language. To roll with one’s wounds, through the wearying air and the sea; with physical torment, through the silence of murderous water and air; with tortures that laugh in their heinous stormy silence. The poet plays on the subconscious and dream-like state reflected in his prose to translate his impressions. Ashbery’s translation renders the poet’s tendency to, instead of naming an object, describe the effect its presence or absence would have on us, as, according to Symbolists, one cannot reduce the world to a concrete image nor describe it through rational knowledge. Symbolism indeed conjures up reality by hiding it behind the ideal and gives voice to poets’ pessimistic philosophy with its themes of death, reverie, landscapes reflecting a disillusionment with existence in states of mind and mythology. What kind arms, what fortunate hour will give me back that region from whence issue my sleep and my slightest movements? 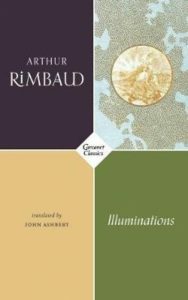 Rimbaud’s hallucinatory visions translated as poetry and prose is beautifully rendered by Ashbery who manages to transcend the limits of language.